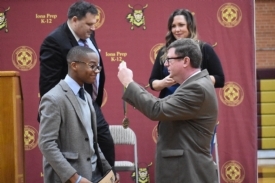 Presented by the National Catholic Educational Association, the prestigious Medal of Honor was awarded to this exemplary young man during a ceremony in the Tully Gymnasium – where his classmates, family and teachers cheered him on. "Jordon Gyapong is a bright and confident young man who has made a strong impact on his school and community," NCEA Chief Advancement and Business Development Officer Matt Russell said. "For someone so young, he has a deep understanding and concern for the needs of others, even those he has never met." A truly remarkable leader, Jordon not only serves his school and local communities, but has also served the poor in Peru and Ghana, championing human rights for all. 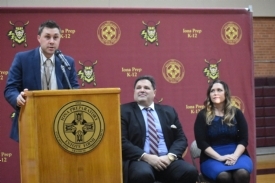 "Despite his accolades, accomplishments and resume, his dedication to listening to and serving others is what is most profound about this young man’s life," Assistant Director of Campus Ministry and Edmund Rice Christian Brothers North American Advocacy Coordinator Sean D'Alfonso noted. 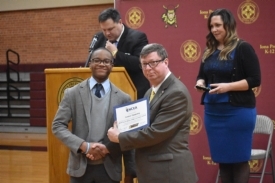 "Jordon Gyapong is one of the most kind, dedicated and selfless young men I have had the pleasure to teach and serve with, and for his tireless efforts to serve others, he was an excellent candidate for this award." 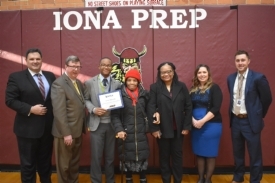 Jordon is perhaps best known for starting the Gael Aviators Club at Iona Prep, where he helped procure a professional flight simulator to help train himself and the next generation of pilots. He is, himself, "flying" through his formal flight training at Westchester County Airport. More than halfway to his pilot's license, which he will likely have prior to his graduation in May, Jordon will be doing a solo, cross-country flight during the Upper School's Mid-Winter Break Feb. 18-22. 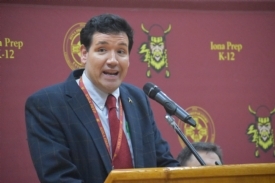 "Jordon is the most selfless student I have ever taught in my career of 22 years, putting the needs of others before his own time and again," World Languages teacher and Gael Aviators moderator Dr. Christopher Minio remarked. This year...he has joined me and a junior in chartering yet another new service-based club called “Latinos Unidos.” In this club, we focus on service to the local Latino community, specifically where there is need for tutoring for children, putting cans on shelves, and warm coats on people who are without." 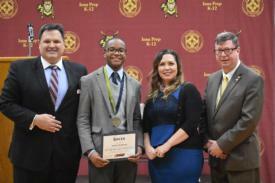 There is a bright future ahead for young Jordon Gyapong, which is why he was chosen out of more than 1.8 million Catholic school students from across the country to receive this prestigious award. "It’s a true testament of the power of advocacy," Gyapong said following the ceremony. "This award was made possible by those who contributed in our advocacy projects, to those who rolled up their sleeves and served the marginalized abroad, and to those who used their time and energy in volunteering in one of our school campaigns." ​​​​​​​Click the link below to see the full slate of this year's Virtues, Valor and Vision awardees, or visit our LocalLive page to watch the presentation.